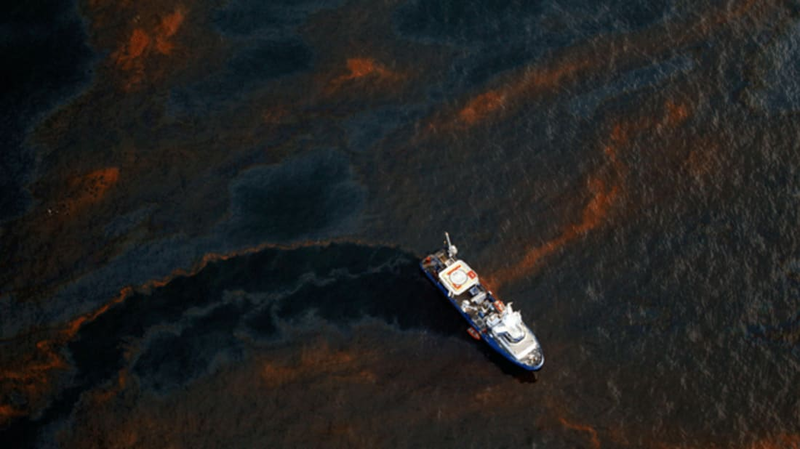 Once oil pollution hits the ocean, it's notoriously difficult to clean up. Researchers at the University of Wollongong, Australia think they've found a way to make the process easier by transforming spilled oil into a magnetic substance, New Scientist reports. As they laid out in their research, recently published in the journal ACS Nano, the component that makes their procedure possible is iron oxide. When added to a small tank of water contaminated with oil, iron oxide nanoparticles bonded to the oil droplets, making them magnetic. A simple bar magnet was effective in dragging out the oil while leaving the water behind. It's still unclear whether the success of the lab experiment can be replicated in the real world. For large-scale oil spills, researcher Yi Du tells New Scientist the particles could be dispersed over the ocean and collected by ships outfitted with magnets. Iron oxide is a nontoxic compound, and any excess particles that don't latch onto the oil could theoretically be sucked up with magnets and used in the future. The 2010 BP Deepwater Horizon oil spill no longer dominates the news, but its effects are still being felt in the Gulf of Mexico years later. On top of the millions of barrels of harmful oil that flooded the sea, even more toxic chemicals were sprayed to break it up. Safer and more efficient cleanup methods could prevent more wildlife from losing their lives in similar disasters down the road. Researchers are currently looking into recreating their experiment in a larger tank and they eventually aim to test it in the open ocean after receiving permission.